My feet are like wings! Don’t you want a pair? I can’t figure out how to make these liturgical. This entry was posted in Linking Back. Bookmark the permalink. 20 Responses to My feet are like wings! Make the laces liturgically correct – green for ordinary time, red for Good Friday etc. Vincenzo: You are too much! ROFL! 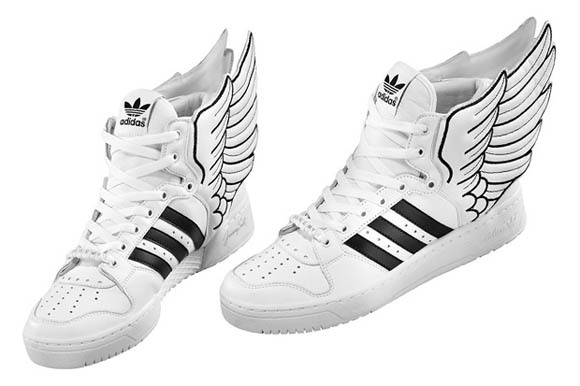 Oh well, Hermes will never wear them …. Duh, Father! We make these liturgical with the ecumencial Mass wherein we honor the ancient Greek religion and liturgically dance a character sketch of Hermes! Pair them up with a giant paper-mache Jesus head and you’ll be all set for a role-playing homily next Ascension. His Royal Airness…Air Z! ZZZZZOOOMMMM…..
St. Paul talked much about running the race. Seems completely appropriate for mass to me…..
That’s sooo funny Vincenzo! It totally made my day. Why, sir, cobble you! A mender of bad soles. Be not out with me; though if you be out sir, I can mend thee. They are not liturgical, they are for when one is being Super Mario. Some things are good but just never liturgical, whiskey, for example. To make these sneakers truly liturgical and fit for the most modern and up-to-date of liturgical celebrations, I would have a liturgical dancer prance them up the aisle along with multiple incense bearers prancing beside and around, producing circles of billious smoke around the shoes as the troupe pranced up the aisle. All would be dressed in flowing white gowns studden with golden sequins so that the prancers would be glistening through the smoke…sort of like the Pillar of Fire and Cloud of Smoke leading the Hebrews out of Egypt. Once the troupe would reach the sanctuary (the liturgical space made known by the presence of a baptismal font, front and center), I would have its members prance around the sanctuary three times, after which the silver platter would be presented to the Celebrantess (attired, of course, in the required Puppet mitre and chasuable). Having received this gift of the gods and goddesses, the Celebrantess would, in turn, prance gayly around the sanctuary three times and then plunge the sneakers in the baptismal font three times. Duly sanctified, the sneakers would become the means of salvation to those who wear them, just as they were for Nike. How’s that for a liturgical daymare?